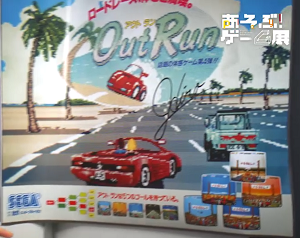 Today's post is a translation / transcription of a new Yu Suzuki video interview in Japanese that was filmed on 29 August 2016 in conjunction with the Retro Games Expo that is being held currently in Saitama prefecture, Japan. 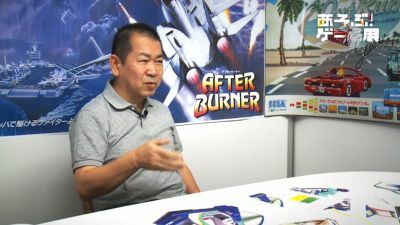 The interview asks Suzuki about his life as a young boy, why he chose to work at Sega, and how some of his famous arcade games came into being. 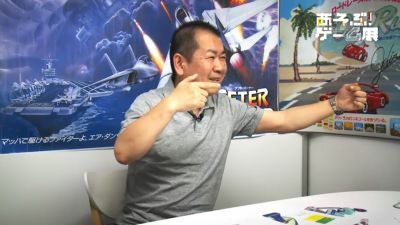 Suzuki also talks about the aspects of arcade game creation that are most important, and gives some advice on the essential attributes of a game developer. Although parts of these stories may been heard before in previous interviews, with each interview there are always new and interesting details that have not come out before. And now, on with the interview! 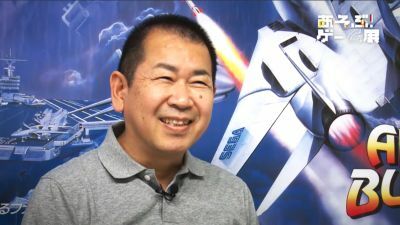 Creator of numerous game hits for Sega including Hang-On, Space Harrier, Out Run, Virtua Fighter & Shenmue. Left Sega in 2008 to become Director at YS NET. Yu Suzuki: I was born in 1958 in a city called Kamaishi. Later we moved to Sanriku village - it’s called Sanriku town now. When I was small, I used to get into fights – my parents had to go around apologizing after me. Up until about 4th grade I was a bit of a tear-away. Through the 4th, 5th, 6th grades I settled down. Suzuki as a child: "I was a bit of a tear-away." It was really rural where I lived so there wasn’t much to play with. 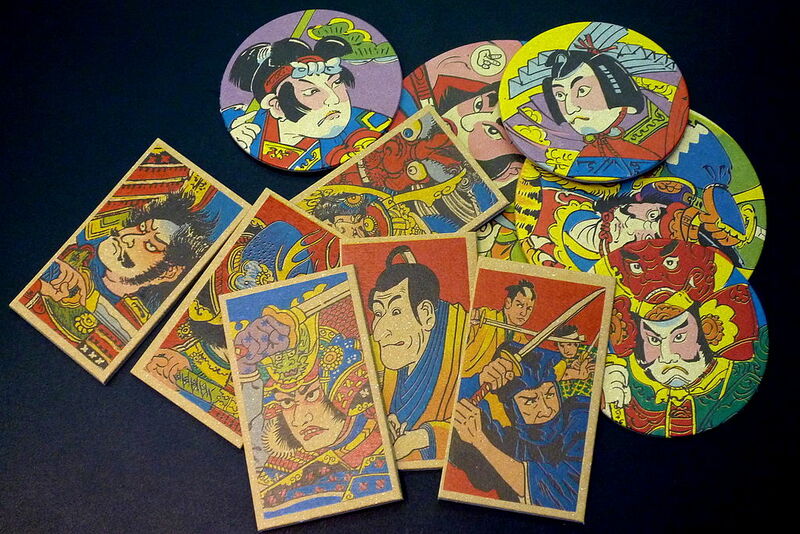 We played at something similar to “Menko” [a Japanese game in which you try to flip over the opponent’s card]. Also... another I can remember was called “Dango Otoshi" [Drop the Dumplings]. We would knead soil and form “dumpling” balls out of it. We’d say things like, “That mountain over there has the best dirt!”, “This is where the good soil is!” or “It’s best to mix it!”. At my home, we had a type of bath that was heated using a small wood fire, so I’d experiment with putting them over the flames. So we’d take turns at dropping the balls onto the ground, and whoever’s broke up first would lose. That’s the kind of thing I used to do. Skiing, too – although I didn’t have proper ski equipment. 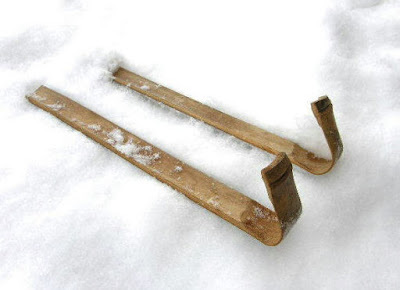 Occasionally it would start snowing, and I used to cut down bamboo and heat it a bit over flames, bending it into shape. I also made places for my feet to fit into, and skied on the bamboo. We used to devise and make our own things to play with. Even when I bought plastic model kits, I wouldn’t assemble them exactly according to the instructions. 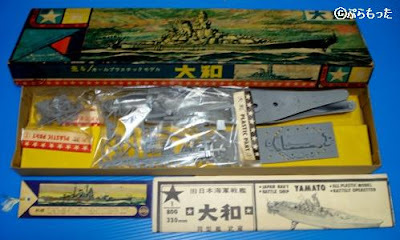 I’d buy a whole lot of model kits, and put them in a big sort of junk box. So eventually I’d have this large collection of parts built up. Then I’d create something myself by fitting together different parts. Q: How did you come to join Sega? 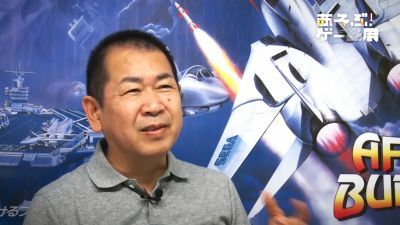 Yu Suzuki: Well... and I hope this doesn’t disappoint anyone wanting to join the games industry [laughs], the real reason that I decided to join Sega is because of their two days off per week! Suzuki joined the company in 1983. Many people who had already found jobs used to bad-mouth their bosses at the class-reunion parties, which made me think that being lucky enough to enjoy one’s work must be a difficult thing to achieve (I suppose my way of thinking may have been more like that of a working adult than a student). I estimated that maybe only 1 person in 100, if that, enjoys their job. I wanted to work hard at my job, so far as that went. But in order for me to fulfill my own interests and desires - and be able to enjoy life - I wanted to ensure I had a clear two days off per week. That was the set-up I hoped for. Being able to secure days off was really important to me. Then after starting at Sega, I found that I fit into that fortunate, 1-in-100 pattern of having enjoyable work that I was getting paid for. Q: How was Hang-On conceived? 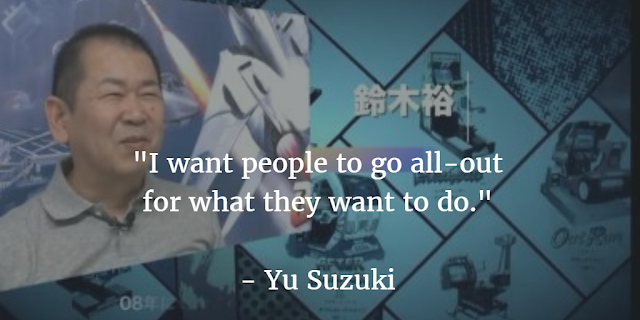 Yu Suzuki: The idea itself for Hang-On wasn’t mine; it was a project that was brought to me. There’s something called a “torsion bar” that has the property of returning back to position when twisted, and there was discussion around whether it could be put to use in some way. When you tip a motorbike, it rights itself when you apply the accelerator, doesn’t it. So this thought of whether the torsion bar could somehow be applied there was how it got started. For my part, I became involved at the development stage to verify and decide what kind of game to put into it, in order to produce the complete game. The torsion bar turned out to be difficult to govern properly, so we ended up fitting it with springs instead. When we carried out our market research at the time, it turned out that the on-road GP500 race was more popular than off-road races. So if we were going to release a bike game for the world market, on-road was the way to go; and for an on-road race, our choice would have to be the GP500. There was a GP500 racer who I admired by the name of Freddie Spencer, and we kept him in our minds during this project. Suzuki relates that he admired famed GP500 racer Freddie Spencer. Q: Was there anything that you weren't able to adopt for Hang-On? Yu Suzuki: The size, for a start. I wanted to make it the exact same size as in the GP500, down to the last inch. But at that size it wouldn’t easily fit into a game arcade. Since it was quite wide to straddle, I did things like narrowing the width a little. One more is that I wanted to put in a mechanism for movement. With a motorbike, if you lean it over and apply the accelerator the bike will return to the upright. I wanted to put in a gyroscope together with a motor, so that when you leaned the bike over you could squeeze the accelerator and have the bike straighten up again. But it would have pushed up the cost. Another thing I wanted to do was recreate the pounding sound of a GP500 motorbike. To achieve a realistic sound we even thought about fitting a small engine... [laughs] but of course, due to exhaust fumes and so on it never went ahead. We considered simulating the wind in your face too, by attaching a fan or an air duct. We had a lot of ideas. I wanted to fit a device to generate vibrations as well. But it would have had a negative impact on the game hardware board, so that was dropped. Instead we put in a woofer of around 25cm and made do with that. The things we had to give up on are innumerable, really. Q: What was Hang-On's reputation? Yu Suzuki: At first, it was a mixed bag. Some doubted whether anyone would want to straddle a bike in front of other people, since Japanese people are very shy. Others said it was unsuitable for people in miniskirts and so on. There were various comments made, with relatively many being negative. At first Hang-On's early reputation was mixed, but this soon changed. Then when it was released, everyone was like, “Do the Japanese like being the center of attention so much?” after seeing the lines of people wanting to ride. Then, after that, we exhibited it at a show in Chicago. I got on the bike and showed some demo play and there was a great response. Some people even asked if I was a racer for Honda. The reaction overseas was especially great, I think. Q: How was Space Harrier conceived? Yu Suzuki: With this one also, the initial idea didn’t come from me. It came from another area in the same section. It was about air-to-ground attack, firing down at the ground from the air like this - [Suzuki makes a zig-zag pattern with his finger]. "Harrier" is the name of a French plane which is able to take-off vertically, and the idea was to use this to perform a flashy air-to-ground attack. Put simply, the idea was a bit too advanced for that time: too much processing power would have been needed. The graphics memory was really small also. We wanted to make the plane bank smoothly like this – [Suzuki weaves his hand left and right]. To achieve this effect, its necessary to change patterns; if we used a human body, we could do so using the absolute minimum number of patterns. So on this occasion we decided to make a person fly instead. A flying person only really made sense in the world of Science Fiction. And for a Science Fiction feel, there was someone I admired called Roger Dean who illustrated the cover illustration for the progressive band Yes. Also, one of the movies I like is The Never Ending Story. I wanted to make a fantastical world, drawing inspiration from elements like these. So I guess what remained of the original proposal I received is really just the name “Harrier”. Apart from that, we changed pretty much everything else [laughs]. Q: How did Out Run come about? Yu Suzuki: Firstly.... I was someone who didn’t play games much. When I was a student, people often asked me along to the arcades, but when I played I would always lose. I used to think to myself, “If it was a real car I would be the fastest one” [laughs]. And in a driving game, the merest impact will cause an explosion. Well, I’ve never caused an explosion when I’ve clipped my own real car. So if I was going to be making a game, I wanted to make one with a car that can be driven well by someone who has a good driving technique with an ordinary car. I wanted a game where you could just enjoy driving, and moreover I wanted to provide as much of a feeling of superiority as possible. I was thinking about how good we could make the player feel for their single 100-yen coin, which this led me to considering the concept of “feeling superior” and I brainstormed on the kind of things that can cause people to feel envious. For guys, their dream car is the Ferrari, right? Naturally the latest model, which at that time was the Testarossa. And furthermore, the convertible! This might have been overdoing it, but I wanted to go decisively go down this path - with a pretty girl riding beside you as you drive along with one hand on the wheel... then claiming first place. So, this is the game that we built around that concept. Yu Suzuki: I often get asked “Yu-san, do you build Games or Simulations?” Basically, I just create games. The reason for that is, simulations are a copy of real life. 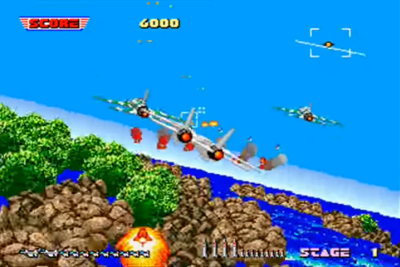 For example, with After Burner, let’s say you have an enemy appear on the screen. Until the player locks on, the enemy will fly along backwards in order to allow them to get the lock [Suzuki holds up both hands, moving them along at the same speed]. It never comes closer. It’s only after they have gotten a lock that the enemy will move in towards the player to attack. So I created it as a game through and through. In a real war, for example, by downing 6 planes you are honored as an Ace. But with After Burner you have to take down 130 or 150 planes... so for me, I’ve always created just games. 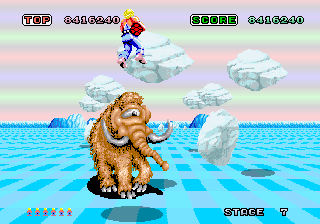 Space Harrier: "Until the player locks on, the enemy will fly along backwards". Q: What do you particularly strive for when it comes to game creation? Yu Suzuki: To make a pure software game that is enjoyable to play again and again. 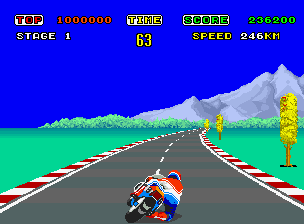 And for the case of Hang-On, for example, to make a game that can be completed on a single coin if you’ve practiced around 200 times. Also for the game to end within 3 minutes on your first play, for sufficient player turnover. To put it simply, from the standpoint of my job, I have to kill off the player within 3 minutes [laughs]. So I need to provide satisfaction from that 3 minutes, and furthermore in such a way that the player will want to continue playing again. That involves things like adjusting the game’s difficulty, as well as providing enough of a replay factor. I have to adjust the essence of the game, if you like. Even with ride-on type games, I think the game has to be fun as an upright as well or there’s no point. It’s somewhat ironic, but I aim to create games that do not rely on the fact they are ride-on games. Q: What attributes are necessary in a game developer? 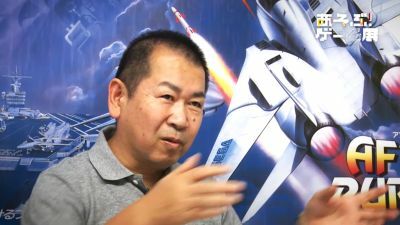 Yu Suzuki: These days, games are produced by a team. But if everyone in the team thinks the same way, and has the same abilities, then it won’t make for an interesting game. If the game ends up being "small and round", with everything harmonious, it won’t sell. I think it needs to have some jagged edges, and have a strong sense of originality; I think it is from games of this kind that hits are born. Suzuki offers words of advice on life. Build up as many experiences as you can of successes and failures – either is fine. Immerse yourself and experience things other people don’t. These will eventually form your own standards. Don’t think about succeeding or failing. I want people to go all-out for what they want to do. That’s the first step, I believe. End of article. Translated by Switch @ phantomriverstone.com. Let me know below on what you thought of this interview & if you want to see more translations like this in the future. Great interview, thks for the trans! It's fascinating to hear Suzuki-san talk such details about his creative process during his arcade creative period, wish we could read more! I also liked hearing about the "ideas that never happened". 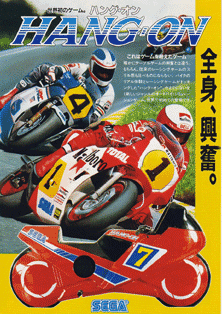 Imagine if Hang-On had been fitted with a working engine! Thanks for translating and posting this. I'm a huge fan of his early work and it's always great to get more insights into the creative process! Glad you enjoyed it! 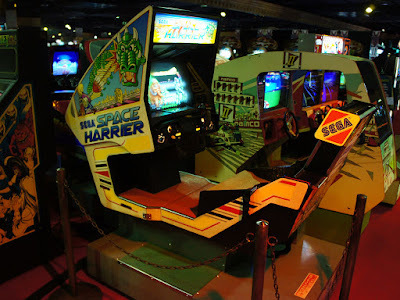 Yes, he really was a driving force during the golden age of arcade games.